Grazing trials have shown the impact of stocking rate (SR) to be variable in terms of profitability and sustainability. The impact of management on land condition, both positive and negative, appears to be episodic. Management therefore needs to be adaptable to avoid the risks associated with prolonged drought and to exploit the opportunities that consecutive good years present. During the past two decades a number of mid to long-term grazing trials have been conducted in various regions across northern Australia. Some common themes have emerged from the results of these trials. One of these themes is that degradation (loss of land condition) tends to be event driven. High stocking rates and high annual pasture utilisation rates are considered to be unsustainable as they lead to a loss of land condition. However, under good seasonal conditions or a string of good seasons, high stocking rates may not cause much degradation. Real degradation is often associated with a very poor season or a string of poor seasons. The Ecograze project conducted near Charters Towers during the mid 1990s clearly showed that high utilisation rates (>50%) in the absence of strategic spelling led to a loss of land condition. However, the Aristida-Bothriochloa (AB) project, conducted over the relatively better seasons of the mid to late 1990s, showed that moderate to heavy stocking rates may have placed the country at risk but did not really lead to degradation. A trial at ‘Wambiana’ southwest of Charters Towers had fair to good seasons for the first half (1997–2001) but very poor seasons for the second half (2002–2006). 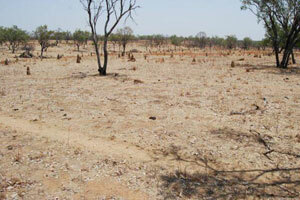 Under the high stocking treatment, there was a significant loss of land condition in the dry years. Economic analyses from ‘Wambiana’ show that a light to moderate stocking rate was profitable and sustainable. The heavy stocking rate was neither sustainable, due to loss of land condition, nor profitable because feeding costs were high, animal production (especially in kg/hd) was inefficient, and animals of lower value were produced. Economic analyses from other studies (e.g. GLASS and ‘Galloway Plains’) indicated that returns were maximised at moderate to high stocking rates but that these rates were probably unsustainable (although no major loss of land condition was seen in either trial). These analyses didn’t fully take into account the long term impact of lost land condition which either reduces carrying capacity or increases management and rehabilitation costs. The other aspect of these two trials was that they incorporated an exotic legume which may have masked the impact of stocking rate on individual animal performance. High stocking pressure during the critical early phase of growth in perennial grasses is detrimental to pasture health. During dry years you often get some rain but it is not enough to sustain pasture growth for more than a couple of weeks. In these situations, even moderate stocking rates lead to high grazing pressure on individual tussocks. This effect is compounded if there are several poor seasons in a row. If degradation is episodic, then pasture recovery probably is as well. Pasture spelling, reduced stocking rate, strategic use of fire, sown pastures and weed management are all useful tools to improve land condition. However, you may need a couple of fair to good seasons in a row to see the full benefit. Conversely, these strategies may not work at all during periods of prolonged drought (although reducing the stocking rate has benefits from an animal management perspective). Country that is in good condition is better able to handle episodic events and is more stable than country that has already lost condition. The rolling ball model explains this relationship. Grazing land management needs to be adaptive. It can have taken many years for a problem to become evident, when it often seems to have done so in a short period of time. Just because a paddock could run 100 breeders during the 1970s and 1980s doesn’t mean it can still run that number. In fact, it is the paddocks where producers have attempted to maintain the higher stocking rates through the last 20 years that now aren’t responding to rainfall – they have lost condition. Reducing stock numbers during dry years helps prevent degradation. You need to be adaptive when the better seasons present themselves to take full advantage of them. This may include planning to use fire, stocking up to take advantage of increased pasture growth, spelling paddocks to allow better grasses to establish and set seed, managing timber regrowth, sowing pastures for a specific reason, and treating weeds. Grazing lands are complex systems and highly variable. Hard and fast rules don’t apply! Stocking to safe carrying capacity, varying stock numbers in response to seasonal conditions (where practical to do so) and spelling paddocks during the growing season (either each paddock once every three to five years or all paddocks each year in a rotational system) are useful principles. High levels of organic matter and good soil structure are key indicators of soil condition. Erosion indicates a loss of soil condition. The density and coverage of 3P grasses (perennial, productive, palatable) determines pasture condition. Weeds indicate a loss of pasture condition. Woody plants compete with pasture for water and nutrients. Increasing tree density indicates a loss of land condition.